Messrs Charron, Girardot, and Voigt, were former racing cyclists who established one of the first French motorcar dealerships on the Avenue de la Grande Armée in Paris in 1897. Each was also successful in motor racing, driving Panhard-Levassors, which was the principal make that the agency sold. 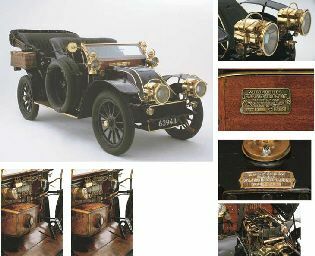 The first CGV motorcar was exhibited in December 1901 at the Paris Salon with manufacture of these high quality and expensive vehicles taking place at a works in Puteaux. CGV only produced cars in limited numbers, 216 being made in 1904, all with four-cylinder engines in three sizes: 18hp, 25hp, and 40hp. These were bought by a wealthy and largely aristocratic clientèle, the 40hp 9.8–litre model selling in England for £1200 – to which would have to be added the cost of the coachwork. Girardot and Voigt left the firm in 1906. It then became Automobiles Charron, this business continuing until 1930. Fernand Charron having married Adolphe Clément's daughter joined his father-in-law's firm in 1908, but he made the Alda car from 1912-1922.